7012 - Sewer Backwater Valves - Jay R. Smith MFG Co.
Used in main or branch sewer lines to protect basements and low areas against backflow from the street sewers. Valve design permits access to backwater valve assembly, for servicing or cleaning, through a "full opening" bolted cover or threaded cover. Duco Cast Iron Body with Bronze Backwater Valve. Cover as Indicated by Figure Number Selected. Smith No. 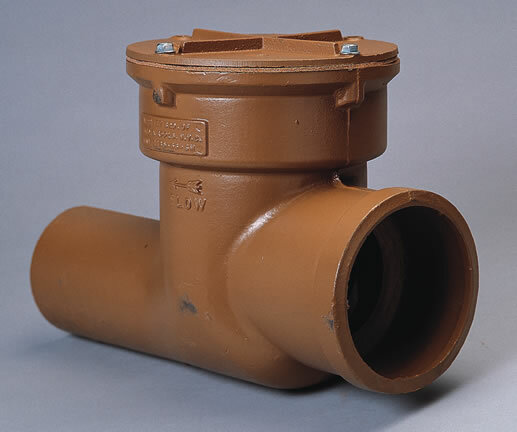 7012 cast iron body and bolted cover with bronze backwater valve assembly. Install so that cover is accessible. Smith No. 7012 cast iron body and bolted cover with bronze backwater valve assembly. Install so that cover is accessible for removal.